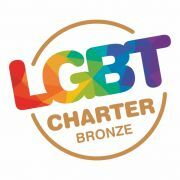 Fantastic news…we have just received word from LGBT that our portfolio was presented to the LGBT Scotland panel this morning, Thursday 24 January 2019, and we have received a very strong LGBT Charter Bronze award! This is in recognition of all the work that young people and staff have collectively engaged in with regards LGBT community rights, embedding of school values, anti bullying and the promotion of the equalities agenda. What a great example of a whole school community coming together to make a difference in the lives of our young people. Silver Award here we come!